Compared to high impact sports like football, baseball seems relatively safe and injury free. Yet many players don't realize the strain that throwing puts on the body. Whipping your arm around to sling a baseball at high speeds puts significant wear on your joints, muscles and tendons, particularly at the elbow. 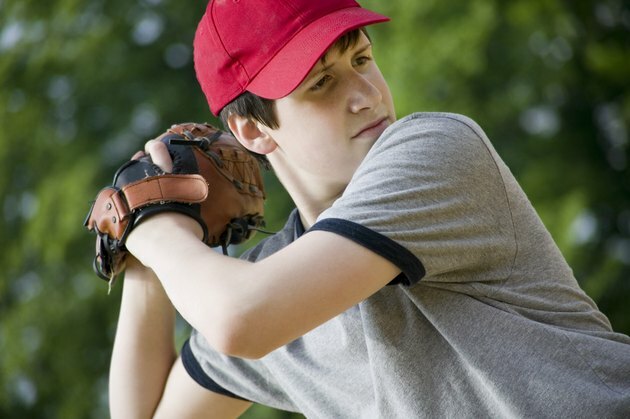 Baseball players who experience pain while throwing a baseball are most commonly inflicted with a form of tendonitis. Elbow tendonitis is an inflammation of the area around the elbow. The elbow is made up of a series of muscles, tendons, ligaments and bones. When these areas become overworked or injured they swell, causing pain in the elbow and surrounding areas when throwing a baseball. Specifically, the problem occurs where the tendons connect muscle to bone. The most usual cause of elbow pain when throwing a baseball is simple overuse which wears down the elbow's anatomy. When throwing a baseball, the tendons on the outside of the arm are stretched to maximum capacity. Conversely, the tendons on the inside of the arm are greatly compressed. The problem is exacerbated in players who do not warm up and subsequently stretch tendons that are cold and stiff. In players that throw often, especially pitchers, the frequent high speed motion can cause weakness in these tendons, eventually causing small fractures and inflammation. Elbow tendonitis is especially common in young players who have not adopted proper prevention strategies. The symptoms of elbow tendonitis are pain and stiffness when moving the elbow. In baseball, symptoms will present mostly with throwing motions. Players may also notice swelling around the elbow. The pain is centered around the elbow, but can spread from the upper arm all the way down to the wrist. Standard treatment for elbow tendonitis is rest, up to eight weeks depending on the case. In addition to rest, players should regularly ice the elbow to help decrease swelling and inflammation. Pain killers may be prescribed in extreme cases. The best way to avoid developing elbow tendonitis is by warming up and stretching properly before throwing at maximum capacity. Always begin your practices or games by engaging in light throwing sessions until your arm is warmed up. Pitchers especially should take plenty of time to warm up before throwing full speed. After your elbow is warmed up, stretch your entire arm; from the wrist all the way up to the shoulder. In between innings, players should wear a sweatshirt or jacket to keep the tendons warm. What Are the Treatments for Pitching Arm Pain?